Violinmakers know that even the most subtle of details are crucial in perfecting the sound quality of fine violins, violas and cellos. Varnish, the liquid coating left to dry on the outer surfaces of the stringed instrument, may seem like an afterthought, but it is far from being so. Expertly formulated and applied varnish can contribute greatly in refining the instrument’s sound quality. More importantly, the wrong primer or varnish can make an otherwise perfectly good instrument sound very poor. The varnishes that appeared on European stringed instruments in the 17th-Century ranged considerably in both sound and appearance. 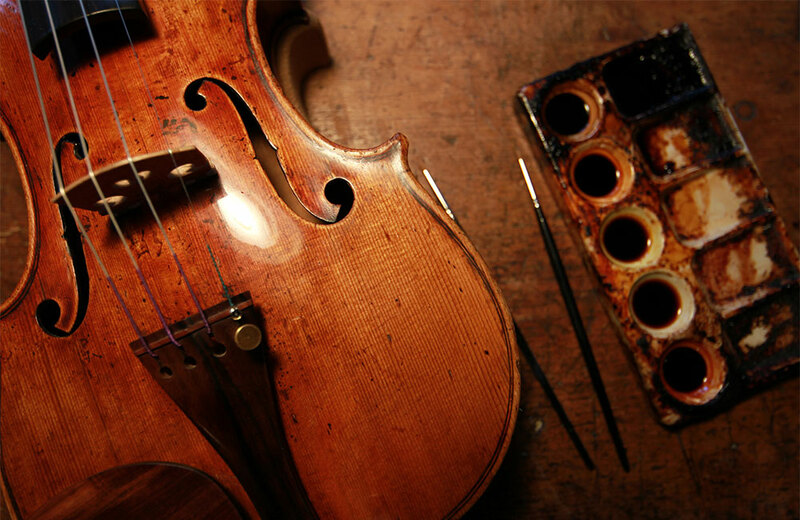 Violin varnishes concocted by Antonio Stradivarius and the Cremonese masters have become the stuff of legend. The Italian-style varnish of the old masters was made in a process of cooking that resulted in a lot of smoke and strong odors, to the extent that it had to be produced in bulk and away from towns and people. This unpleasant process was eventually replaced with easier, homemade varnishes of resins and pigments dissolved in alcohol, often overly sealing and hardening instruments, causing them to sound slightly too harsh and flat. The delicate, warm sounds of the old Italian masters became increasingly rare. 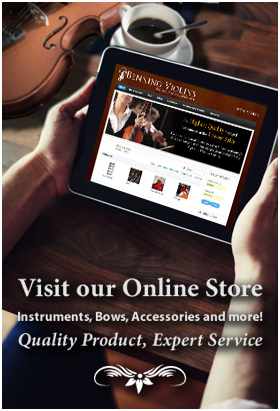 However, in recent modern-day making, many violinmakers have returned to experimenting like the old masters, each affirming their proprietary recipes to obtain the desired sound for their instrument. A sleek and shiny finish may seem the most desirable to violinists, as it is more durable, easier to keep clean, and ages with fewer signs of wear. However, lighter coatings may be more than enough to emphasize the quality and beauty of the wood of an already beautiful instrument. On the other hand, fine violin bows are varnished differently from the instrument’s body, requiring a strong and durable coating, making col legno possible, the tapping of the strings with the wood of the bow, an instruction that appears in many 19th- and 20th-Century compositions.